When to Call Your Doctor? Chemotherapy and You is written with you in mind - someone who is currently receiving or about to receive chemotherapy for cancer. Surely you have lots of questions and hopefully this page will help answer some of them. Cure cancer - when chemotherapy destroys cancer cells to the point that your doctor can no longer detect them in your body and they will not grow back. Control cancer - when chemotherapy keeps cancer from spreading, slows its growth, or destroys cancer cells that have spread to other parts of your body. Ease cancer symptoms (also called palliative care) - when chemotherapy shrinks tumors that are causing pain or pressure. Make a tumor smaller before surgery or radiation therapy. This is called neo-adjuvant chemotherapy. Destroy cancer cells that may remain after surgery or radiation therapy. This is called adjuvant chemotherapy. Help radiation therapy and biological therapy work better. Destroy cancer cells that have come back (recurrent cancer) or spread to other parts of your body (metastatic cancer). Sometimes, chemotherapy is used as the only cancer treatment. But more often, you will get chemotherapy along with surgery, radiation therapy, or biological therapy. The IV route is the most common form of administration. The IV route gets the drug dispersed quickly throughout the body. IV therapy may be given through a vein in the arm or hand or through a vascular access device (VAD), which includes a catheter implanted into a larger vein in the chest, neck, or arm. The advantages of the VADs include: to give several drugs at one time, for long-term therapy, for continuous infusion chemotherapy, and more stable access in a larger vein thus reducing the risk of drug leaking outside of the vein. Catheters are a soft, thin tube. A surgeon places one end of the catheter in a large vein, often in your chest area. The other end of the catheter stays outside your body. Most catheters stay in place until all your chemotherapy treatments are done. Catheters can also be used for drugs other than chemotherapy and to draw blood. 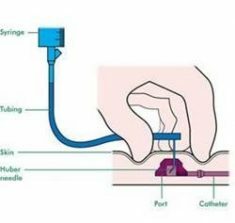 A port is a small, round disc made of plastic or metal that is placed under your skin. A catheter connects the port to a large vein, most often in your chest. Your nurse can insert a needle into your port to give you chemotherapy or draw blood. This needle can be left in place for chemotherapy treatments that are given for more than 1 day. How often is chemotherapy given? Chemotherapy is generally given at regular intervals called cycles. A cycle may involve one dose followed by several days or weeks without treatment. This allows normal tissues time to recover from the drug’s side effects. Alternatively, doses may be given several days in a row, or every other day for several days, followed by a period of rest. Some drugs work best when given continuously over several days. If more than one drug is used, the treatment plan will specify how often and exactly when each drug should be given. The number of cycles you receive may be determined before treatment starts (based on the type and stage of cancer) or may be flexible, in order to take into account how quickly the tumor is shrinking. Certain side effects may also require doctors to adjust chemotherapy plans (dosage or schedule) to allow you time to recover. What happens before, during, and after treatment? Before you can begin treatment, your doctors must first run tests to determine what type of cancer you have and if it has spread to other parts of the body. Once the diagnosis has been made, you will probably talk with your primary care physician along with several oncology specialists, such as a surgeon, a medical oncologist and a radiation oncologist, to discuss your treatment choices. Often, these specialists will work together to help recommend the best treatment for you. In some cases, your cancer will need to be treated by using more than one type of treatment. For example, if you have breast cancer, you might have surgery to remove the tumor (by a surgeon), then have radiation therapy to destroy any remaining cancer cells in or near your breast (by a radiation oncologist). You also might receive chemotherapy (by a medical oncologist) to destroy any remaining cancer cells that have traveled to other parts of the body. If you are considering chemotherapy, you must first schedule a visit with a medical oncologist to see if chemotherapy is right for you. During your initial visit, the doctor will evaluate your need for chemotherapy and its likely results. This includes reviewing your current medical problems, past medical history, past surgical history, family history, medications, allergies and lifestyle. The doctor will also perform a physical examination to assess the extent of your disease and judge your general physical condition. After reviewing your medical tests, including CT scans, MRI scans and PET scans, and completing a thorough examination, your medical oncologist will fully discuss with you the potential benefits and risks of chemotherapy and answer your questions. Once your chemotherapy treatment plan has been prescribed by the Medical Oncologist, the nurses will coordinate your chemotherapy treatment schedule with you, as well as any necessary laboratory or radiology tests that need to be performed on an ongoing basis. Depending on your specific chemotherapy drugs prescribed, the drugs will be mixed prior to your treatment and administered by the oncology trained nurses according to the administration method dictated by the physician. Throughout the chemotherapy administration, the nurses will be monitoring you and your vital signs often. The length of your treatment can vary from several minutes to several hours, again depending on the type of chemotherapy you are receiving. During your chemotherapy cycle, your medical oncologist and nurse will see you regularly to follow your progress, evaluate whether you are having any side effects, recommend treatments for those side effects (such as medication) and address any concerns you may have. As treatment progresses, your doctor may make changes in the schedule or treatment plan depending on your response or reaction to the therapy. Your medical oncology team may gather on a regular basis with other healthcare professionals to review your case to ensure your treatment is proceeding as planned. During this session, all the members of the team discuss your progress, as well as any concerns. After treatment is completed, follow up appointments will be scheduled so that your medical oncologist can make sure your recovery is proceeding normally and can continue to monitor your health status. Your medical oncologist may also order additional diagnostic tests. Reports on your treatment can be sent to your other physicians. As time goes on, the frequency of your visits will decrease, but you most likely will always follow up with the medical oncologist on a regular basis. However, you should know that your medical oncology team will always be available should you need to speak to someone about your treatment. Chemotherapy drugs are made to kill fast-growing cells, but because these drugs travel throughout the entire body, they can affect normal, healthy cells as well. It is the damage to healthy tissue that causes the side effects. Most likely to be damaged are normal cells that divide rapidly including: Bone marrow/blood cells, hair follicles cells, and cells in the reproductive and digestive tracts. Side effects are different for each person, for each chemotherapy drug, and they also differ based on the dosage, the route the drug is given, and how the drug affects you individually. The most common side effects of chemotherapy include: nausea and vomiting, hair loss, fatigue, an increased chance of bruising and bleeding, and getting an infection. Most side effects gradually disappear after treatment ends because the healthy cells recover quickly. The time it takes to get over some side effects and regain energy varies from person to person and depends on many factors, including your overall health and the specific drugs you are receiving. Doctors have many ways to prevent or treat chemotherapy side effects and help you heal after each treatment session. Talk with your doctor or nurse about which ones to expect and what to do about them. Make sure to let your doctor or nurse know about any changes you notice. Who are the members of the Medical Oncology Team? A team of highly trained medical professionals will be involved in your care during chemotherapy. This team is led by a medical oncologist, a doctor who specializes in treating cancer. Medical oncologists are the doctors who will oversee your chemotherapy treatments. These physicians work with the other members of the medical oncology team to develop and prescribe your treatment plan and make sure that each treatment is accurately given. Your medical oncologist will also monitor your progress and adjust the treatment as necessary to make sure you get the best care throughout the course of treatment. Medical oncologists help identify and treat any side effects that may occur due to the chemotherapy. They work closely with other physicians, including radiation oncologists and surgeons, and all members of the medical oncology team. Medical oncologists have completed at least 4 years of college, 4 years of medical school, 3 years of residency (specialty) training in medicine and then 2 years of fellowship in medical oncology training. They have extensive training in cancer medicine and the use of chemotherapy to treat disease. Connect and follow along to learn more about us and events happening near you.